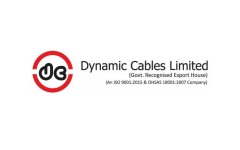 Business description - Dynamic Cables is engaged in manufacturing of Cables and Conductors which widely include manufacturing of Low Voltage and High Voltage Power Cables, Aerial Bunched Cables, All Aluminium Conductor (A.A.C. ), All Aluminium Alloy Conductor (A.A.A.C. ), Aluminium conductor steel reinforced (A.C.S.R.) Conductors and Service Drop Cables used for transmission and distribution of Electricity. Its manufacturing facilities are distributed in three units located in Jaipur, Rajasthan. In addition to above, the company is in process of installation of Unit-IV located at Plot no. A-129, A-129A and A-130,SKS industrial Area Reengus, Distt. Sikar, Rajasthan, India for manufacturing of new range of cables and conductors such as : 66KV High Voltage cables, Railway signaling cables and Optical fiber ground wire. The company is also serving sectors like - Industrial, Exports, Turnkey projects, Power Distribution Companies, Infrastructure works etc. in India and abroad. It is presently exporting directly and indirectly through merchant exporters to many countries in the Asian subcontinent, Africa and Middle East. Some of countries where it exports are Kenya, Tanzania, TOGO, Nigeria, Benin, Uganda, Rwanda, NEPAL, Mauritius, Afghanistan, Jordan, Dubai etc. Dynamic Cables is approved by Powergrid, BHEL, Larson & Toubro Ltd, TATA Projects Ltd, North Western Railways, Public Works Department, Maharashtra along with all major state electricity boards in India. Its products are also widely being used amongst various Indian private clients which include: Gammon India, Jaguar Overseas,Mohan Energy, L&T, TATA, Bajaj, Voltas etc. Dynamic Cables IPO allotment status is now available on Bigshare Services' website. Click on this link to get allotment status. Pricing of the IPO is superb and all the talks about legal cases are just trash talks. I’ve read the prospectus and most the cases are payment related which are same for any manufacturing firm. Dynamic cables will be the receiver once these cases are settled. Debt/equity is 2.1 which is high and that’s why valuation is low but it is still quite a deal for investors if we compare debt with fundamentals. Anyone knows gmp/kostak ? Is the story about the company having 97 litigations pending against it ture ? maybe that’s the reson for such low valuations ? What’s D/E ratio like ? Everything looks good but the only concern is it should not end up like DP Wires IPO. Cable manufacturing is a capital intensive business, there will have to be fixed inputs every time a unit of cable has to be manufactured, and so if margins get eaten into then the profits margins will be less. Though valuations are low, still debt equity around 2.5 and interest coverage just around 2. PE ratio is less than 8 and the offer price is just a bit low than book value. It is like the company is on a sale. Grab it very good price. Will double in no time. Its good . Subscribe it. Profitable company. i think it has good valuations.